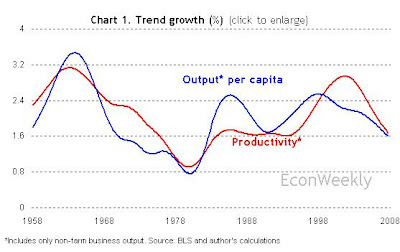 Productivity is the main determinant of long-run growth. In the United States, between 1958 and 2007, the average growth of output per capita has been 2% per year, whereas the average growth of productivity —output produced in one hour of work— has been 2.1%. But productivity growth fluctuates a lot, and the latest changes are uncomfortable to look at. At the end of 2007 trend productivity growth was 1.7%, 1.3 percentage points down from the fourth quarter of 2001. Now productivity increases at the same pace as it did before the information revolution of the 1990s (see Chart 1). Why? My story is one of sectoral shifts. The second half of the 1990s was marked by technological improvements in telecommunications. Cell-phones, e-mail, software and, above all, the internet, did two things: they lowered the cost of gathering information, and facilitated interactions among workers, both within and between firms. Both boosted productivity in knowledge-based industries. Not only that: those technologies created new jobs and even entire sub-industries. Over time those technologies became well established. Investment in equipment slowed down. New job openings were filled by people coming from other industries, who were less productive than incumbent workers. To put it in two sentences: 1995-2001 was a period of technological deepening and creation of new services and industries; 2001-2007 were years of re-allocation of workers towards services. The data are suggestive: during the business cycle of July 1990 to March 2001, the decrease in payrolls in the manufacturing sector accounted for just 4% of the total change in jobs in the private economy (see Chart 2). Since March 2001, the bleed of manufacturing accounted for 76% of the change in employment. But another change is in the works. During the current business cycle, most jobs have been created in industries where it is difficult to increase productivity. Health services are a notorious example: 62% of the increase in non-farm payrolls happened in the health care industry. (Hat tip to Michael Mandel, from BusinessWeek.) It is hard to increase the value of services per hour in that sector, because we still rely on a large number of doctors, nurses, orderlies and administrative personnel to deliver one unit of output. Without having done an in-depth analysis, I would say that we have made enormous technological progress in diagnosing and treating health conditions, but that those technologies don’t save any labor. A similar argument applies to the leisure and hospitality industry (hotels, restaurants, etc. ), which absorbed 39% of the change in employment. Until we teach a robot to fry your eggs and make your bed, productivity will increase slowly. Productivity is the most important, but not the only driver of growth. An economy produces more output per capita by: employing a higher fraction of the population, working longer hours, or squeezing more output per hour. 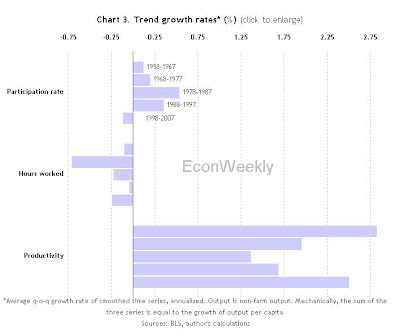 Chart 3 shows the trend growth rates of each of those components. (I call them “trend” because they are constructed using smoothed time series. Technical details below.) The sum of the three series is equal to the growth rate of output per capita. Increased participation in the labor force (top panel in chart 3) has grown by less than 0.5% in most decades. Hours per worker (middle panel) have declined decade after decade, reducing the growth of output per capita. But output per hour (bottom panel), also known as productivity, has grown routinely at annual rates well over 1%, and in some decades 2%. Going forward, there are reasons to believe that productivity gains will become even more important. In a nutshell: the fraction of people who work is going to decrease. The fall of the participation rate already subtracted 0.12 percentage points from the growth rate of output per capita between 1998 and 2007 (see chart 3, top panel). Historically, the employment-population ratio has increased thanks to women, whose participation has increased since WWII. That trend has probably played out. The female participation rate reached a historical maximum of 58% in 1999, and since then it has stayed roughly constant. More importantly, the large generation of baby-boomers born between 1946 and 1964 will gradually retire from 2011 through 2030. That will push the participation rate down because their descendants, the X and Y generations, are not numerous enough to replace them. And immigrants don’t improve the employment-population ratio much because they add to both the numerator and the denominator. Now let’s put together these pieces: the economy is re-allocating resources towards health and labor-intensive services; population aging will increase the demand for those services and reduce the number of people who provide them; and the information technologies of the “e-era” raise productivity at decreasing rates. Can the U.S. economy continue to deliver a growth rate of 2% in output per capita? And, if so, what will be the next driver of productivity? Technical details: I use time series on hours, employment and non-farm business output (from BLS productivity data base), and on the employment-population ratio (from the CPS data base). First of all, I calculate quarter-over-quarter growth rates for each time series, by taking differences in logarithms, and then I annualize them by multiplying by four. Then I apply the Hodrick-Prescott filter to each growth rate series, with smoothing parameter equal to 5000. Finally, the growth rate of productivity is the smoothed growth rate of output minus the smoothed growth rate of hours; the growth rate of hours per worker is the smoothed growth rate of hours minus the smoothed growth rate of employment. The growth rate of output per capita (displayed on chart 2) is the sum of the growth rate of participation and the constructed growth rates of hours per worker and productivity. We were successful to explain(smoothed by MA due to high measurement noise) evolution of productivity (as expressed by $ per hour from the Conference Board data base) in the USA as a function of labor force participation rate, LFP, as pubslished by the BLS.